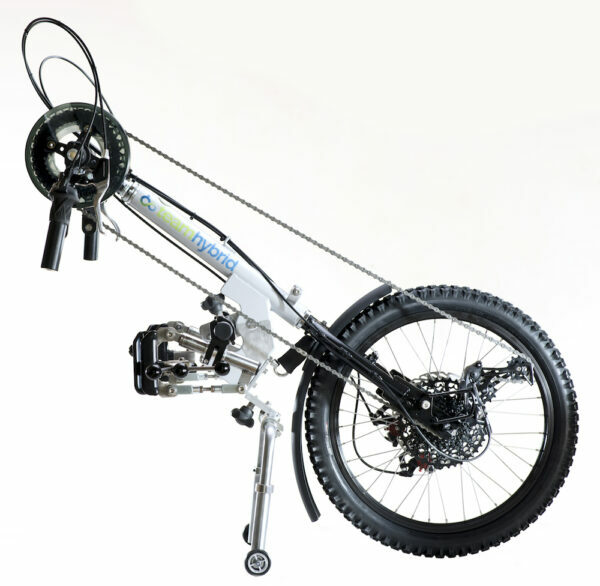 Coyote S11 Clip-On is the most popular of our manual handcycle attachments. The 11-42T 11-speed cassette and single chainring give a wide ratio of gears suitable for all occasions. Double BB5 Disc Brakes are a standard feature with all shifters and brake levers mounted on the handles. Coyote S11 Clip-On is a quick release wheelchair attachment designed to fit the majority of rigid frame wheelchairs, plus many folding wheelchairs. 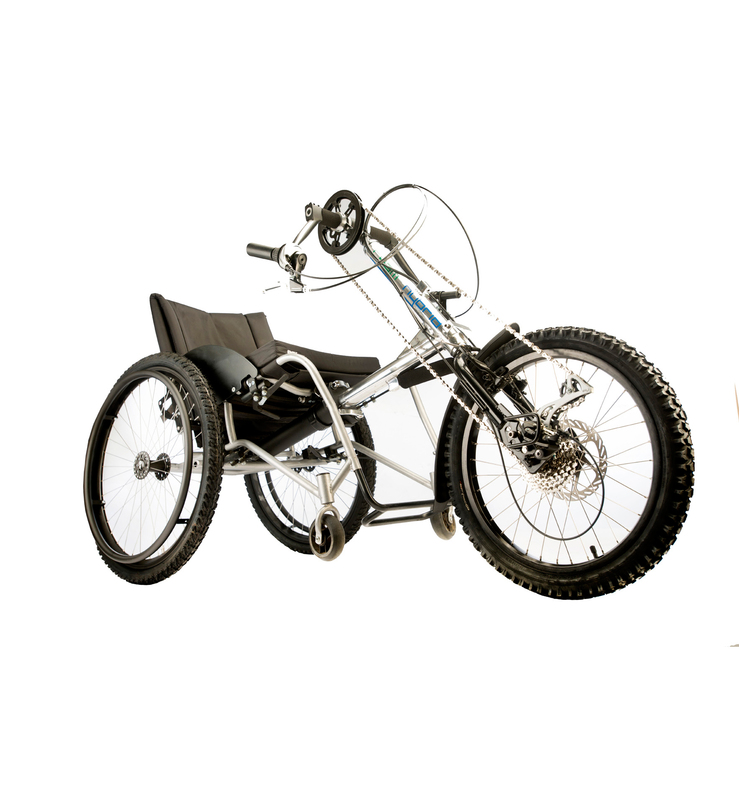 The Coyote clip on manual handcycle will transform your wheelchair into a brilliant sleek and sporty handcycle. 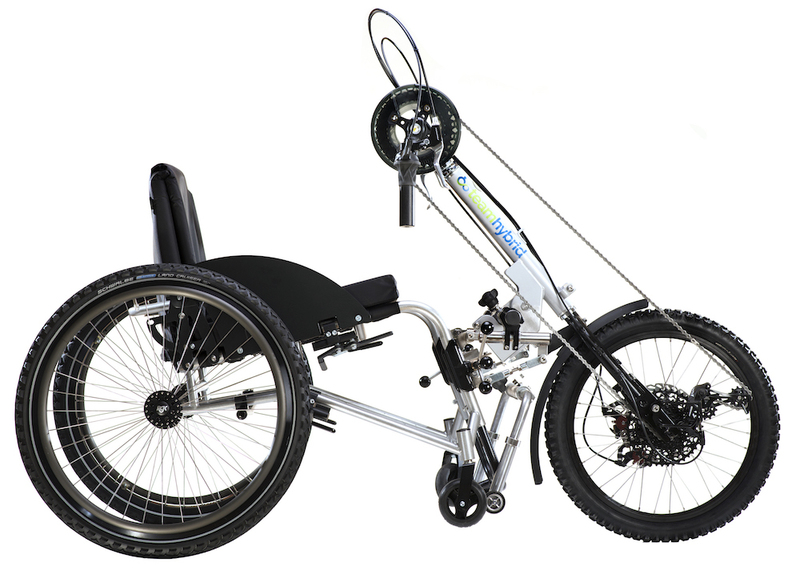 This is our best selling manual handcycle and it’s easy to see why. 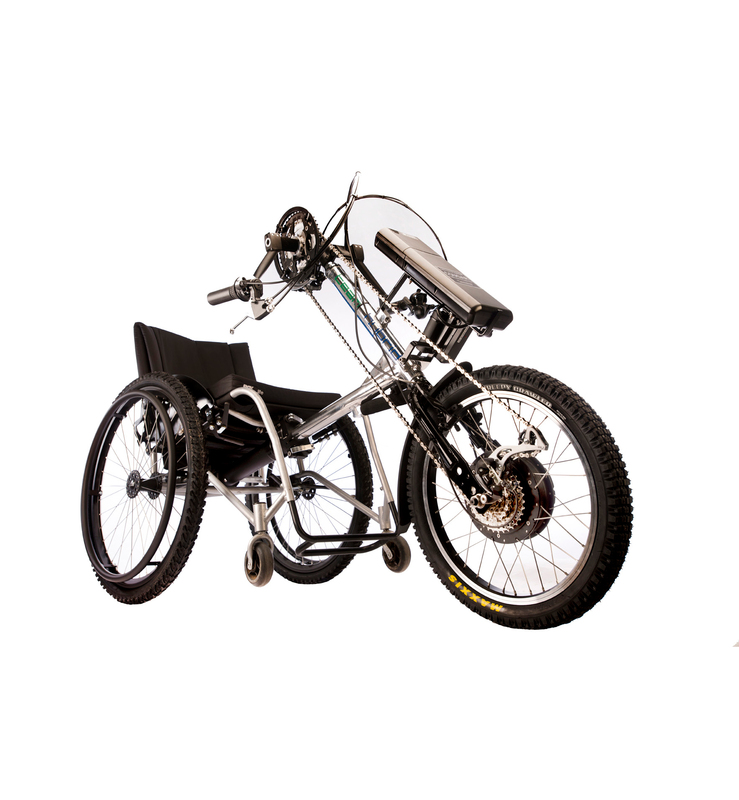 With custom-built hardware, great style, and hardwearing Mountain Bike based 11-speed drivetrain, Coyote S11 Clip-On is the handcycle of choice whether you are cycling for leisure or for fitness. Coyote S11 comes equipped with both SRAM Double Disc brake ensuring consistent, reliable stopping power whatever the conditions. Wheel removal/tire changes are made easier thanks to the Shimano QR front hub. Hand-cycling is a fantastic way to get your aerobic exercise, regular hand-cycling will improve muscle strength and stamina. Cycling with Coyote S11 will also improve your circulation and respiratory functions through active exercise, burn up calories for weight control and weight loss and promote relationships with friends and family. Coyote S11 can be connected to most rigid wheelchairs and many folding wheelchairs via a unique docking system that requires no extra brackets fitted to the wheelchair. 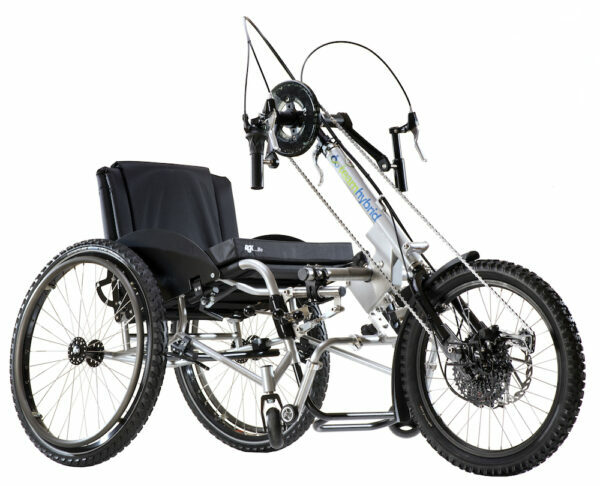 We have designed the Clip-On system to fit virtually any rigid frame wheelchair, plus a large majority of folding wheelchairs, without the need of extra brackets or hardware being added. (we cannot fit to folding wheelchairs that have removable footrests). 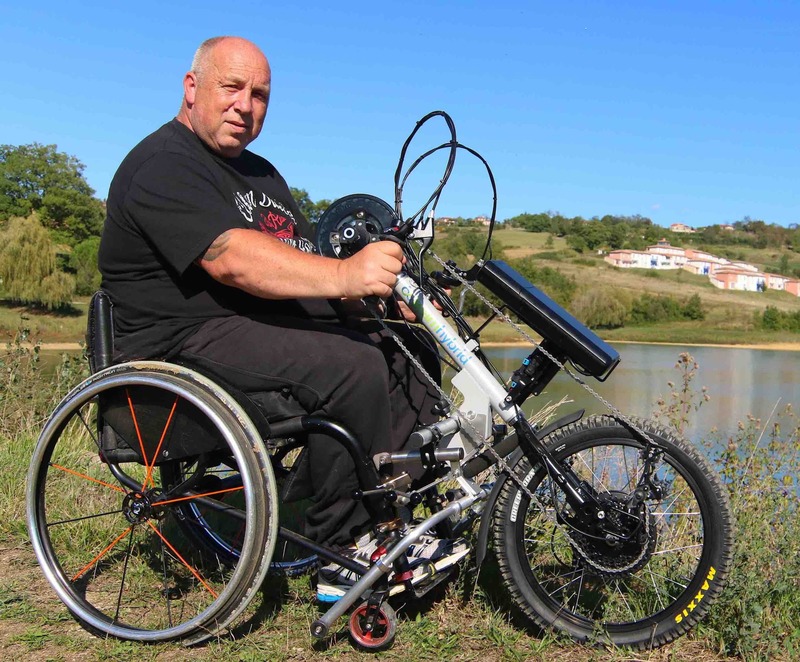 Our unique clamping method has masses of adjustability and will clamp to your wheelchair with a vice like grip thanks to the powerful jaws. The rider wheels up to the Clip On handcycle and into the clamps. With a few turns of the tightening levers the clamps grip to the front down tubes of the wheelchair. 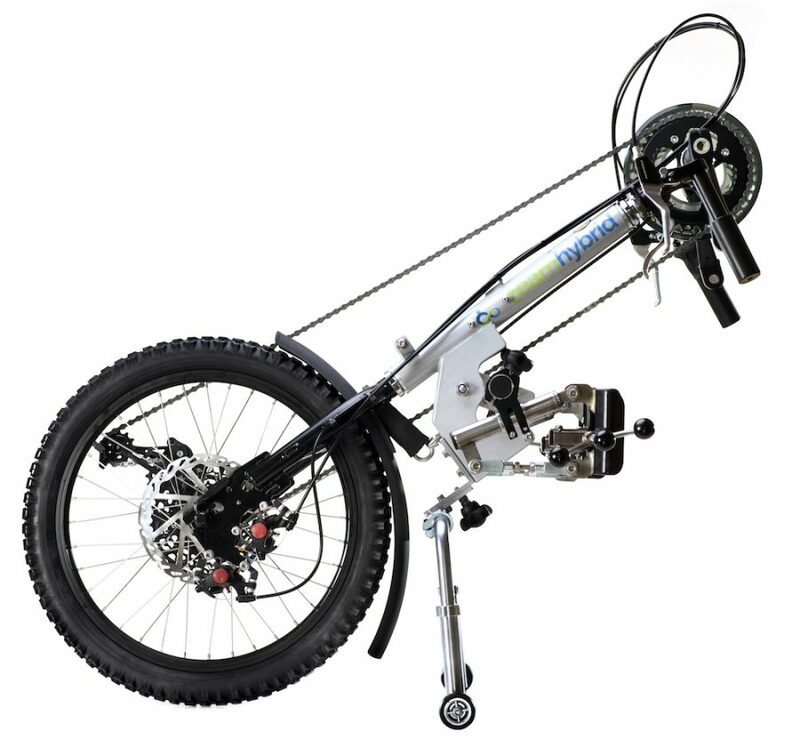 The rider then pushes the top of the handcycle away from himself or herself, thus lifting the wheelchair casters off the ground; the latching system will simultaneously lock in to place. Once docked, the user activates a secondary safety lock. This safety lock ensures that the system cannot be undocked accidently, even when the main release lever is activated. To undock the rider must be stationary. The PVC coated clamping jaws have been designed to lock onto 19mm tube all the way up to 35mm tube, this covers a vast range of wheelchairs. 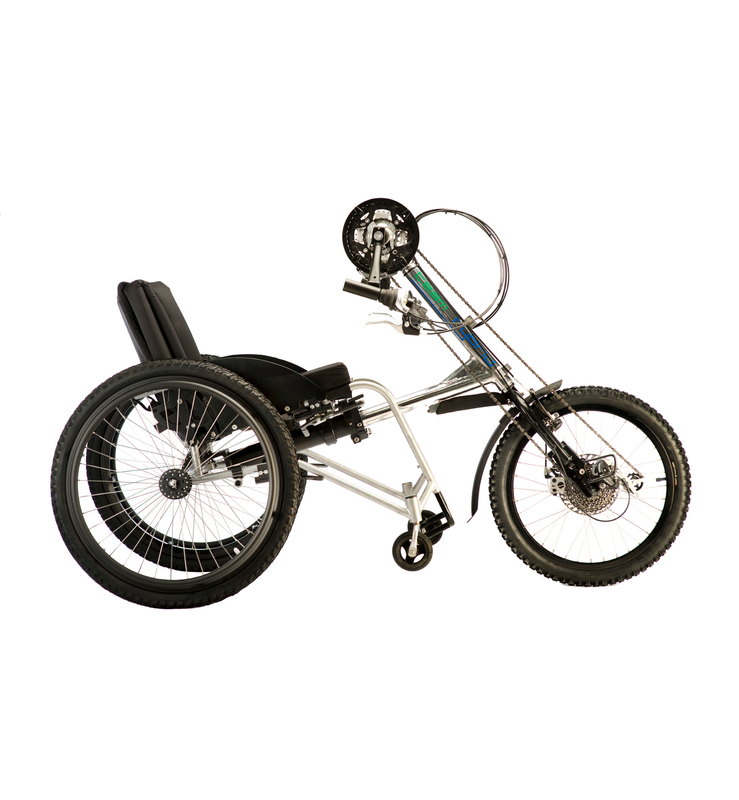 The amount of adjustability available ensures our system will fit tapered, V, and straight wheelchair front down tubes. The quick release stand is both height and width adjustable. 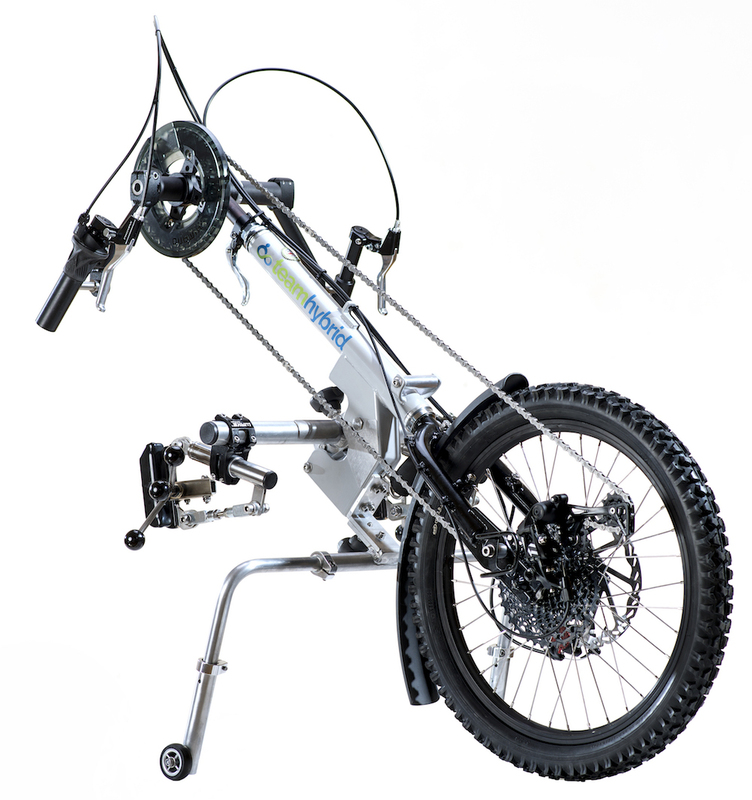 The quick release function allows for a more compact cycle, especially important when transporting your handcycle in the car. Team Hybrid’s policy is that of continuous product improvement. Specifications listed in this document or elsewhere including promotional photos, are subject to change without prior notice.